KVM is a commonly used term in computer driven industries that stands for "Keyboard, Video, Mouse." They are usually brought together because they are the three components that make up a console. A console is a work station where the minimal requirements are simply a monitor, keyboard, and mouse. There are many situations that require one person to be able to use two computers. It isn't practical to have two computers on your desk with two separate monitors, two keyboards, and two mice. In some situations, like in large server rooms, one user will need to be able to control dozens of systems from one single console. There is a KVM Switch made for every conceivable scenario with different types of ports, whether you are using a USB or PS2 a mouse and keyboard, a DVI or a VGA monitor, whether you need it to be rackmountable (in server room situations), or even if you need the console built into the switch, or want to control your computers remotely over IP, or if you need to support multiple monitors and an extended or mirrored desktop. For your most basic scenarios, you probably will only need to switch between two computers. One scenario we often see is when a designer or video editor needs to use both a PC and a Mac simultaneously at work. If his work network is only PC-friendly but he uses his Mac to edit graphics or movies, he will want to switch back and forth quickly at the touch of a button. With these simple KVM switches, simply connect your mouse, keyboard, and monitor to the KVM switch's console ports and connect your computers to the switch's computer ports. Most switches have both hot keys you can use (commonly the hot key is hitting “scroll lock” twice to switch) and a button or switch on the switch box itself. Some KVM switches also switch the audio-in and -out ports, too. There are KVM switches that allow you to control and switch between many computers over the internet. This can be very useful if your server setup is located off-site and you don't want to drive over there every time you want to make changes. These switches can be assigned an IP address and accessed from anywhere in the world with the correct username and password. Another popular desired function with KVM consoles is extension. KVM Extenders allow you to control a computer from far away by using a cheap medium such as Cat5 cable. These extenders generally come in two units: a sender and a receiver. The user plugs their monitor keyboard and mouse into the sender, a Cat5 cable connects the sender and receiver, and the receiver is plugged into the remote computer you want to control. An HDMI KVM switch gives you all the benefits of a regular KVM switch but enables you to use your High Definition displays through HDMI connections. Modern HDMI KVM switches will have USB ports instead of the old PS2 port. Since HDMI cables also carry an audio signal, there is also reduced clutter since you do not need to run extra cables for audio. These devices are usually Plug-and-play and do not require the need to install additional drivers or software. Macs don't have the Scroll Lock button. Generally, if you are using a Mac keyboard in your KVM setup, you are going to need to look for a switch with a button or a switch on the switch box itself. USB/PS2 adapters aren't 100% guaranteed to work with switches. This problem, though unexpected, does exist occasionally. If one of the computers you are using does not have PS2 ports, it is recommended you just get a USB switch and use the USB ports on both computers, as well as a USB mouse and keyboard. DVI/VGA adapters can also be problematic. This problem usually stems from one simple principle. If you are using computers that output a DVI signal and you want to use a VGA monitor and a VGA switch, you must ensure that the computer outputs a DVI-I signal. This is a DVI protocol where both analog and digital signals are "integrated”. If not, you will need a DVI to VGA scaler, which may cost another couple hundred bucks. Wireless Mouse/Keyboard Sync Problems. Often when a wireless keyboard and mouse are used with a switch, the keyboard and mouse have to re-sync to the computer currently in use which can prove to be annoying. 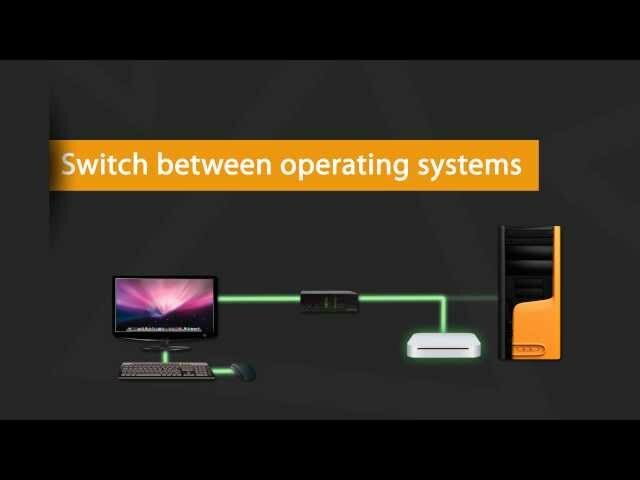 The opposite of KVM switching would be PC sharing. PC sharing is a cost-effective way of getting two consoles to share a computer's processor, RAM, hard drive, and other expensive assets. These kits often come with an extra video card for the extra console and enable two monitors, keyboards, and mice to work independently of each other while sharing a single computer. This is a popular solution for classrooms, call centers, and other situations where minimal processing work is required to complete tasks.